Accused of crushing dissent ahead of elections in July, Cambodia’s leader Hun Sen came to last month’s ASEAN summit in Sydney threatening to “beat” protestors. But his critics are defiant— and ready to travel the distance. Rosalee Kiely goes along for the ride. It’s a Friday evening in mid-March, and around 150 people from Australia’s Cambodian (Khmer) community gather at their temple in Springvale, in Melbourne’s south-east, snapping group photographs and loading boxes of food and crates of water onto buses. They’re in for a long haul: an overnight trip in a convoy of buses to Sydney where they would join Cambodians from around the country in a protest against visiting Cambodian Prime Minister Hun Sen. He’s among the regional leaders descending on Sydney for the Association of Southeast Asian Nations, or ASEAN, summit. The protestors, drawn from Australia’s roughly 33,000 Cambodian migrants, want the Turnbull Government to confront the Cambodian Prime Minister over his escalating crackdown on political opposition and alleged human rights abuses back home. The day before the summit, as the Cambodians in Springvale prepare to board the buses, their excitement is palpable — as is their outrage. “I have to go and see how he [Hun Sen] beats my people,” says Ngoc Minh Thach (Danny), a Khmer Krom (Khmer from Vietnam) as he waits to board the bus in the temple car park. It is a reference to Hun Sen’s widely publicised threat in February towards Cambodian-Australians if they burn his effigy in protest during his visit. “I will pursue them to their houses and beat them up,” he said. After the summit is completed, the Australian Government does make a statement condemning the decline of civil and political rights in Cambodia. But it was noticeably less forthright in the lead-up to the event, which critics say stemmed from a desire not to make waves in the lead-up to the ASEAN gathering. Australia is also party to a $55 million dollar refugee resettlement deal with Cambodia, which last May saw just three refugees continue to live in the country. Hun Sen, a former Khmer Rouge fighter, has held power in Cambodia for over three decades, and critics believe that human rights abuses in the country are getting worse ahead of elections scheduled for July 29. Three days before the ASEAN summit, Rhona Smith, the UN Special Rapporteur on Human Rights, repeated her call for the restoration of fundamental freedoms in Cambodia. Opposition leader Kem Sokha was last September jailed on treason charges, and his party, the Cambodia National Rescue Party (CNRP), forcibly dissolved. Kem Sokha is accused of a CIA-backed conspiracy to topple the Cambodian Government, with Hun Sen citing as evidence a speech the Opposition leader made to Cambodian-Australians in Melbourne in 2013. During a Senate Estimates hearing in early March, Shadow Foreign Affairs Minister Penny Wong said it was “deeply concerning” that for the second time dissident activities in Australia were being used as a pretext for anti-democratic actions by the Cambodian government. It’s dark by the time the protest convoy pulls out from the temple grounds and heads down Springvale Road. Protesters scroll videos on Facebook of a smaller protest that just happened outside Hun Sen’s accommodation in Hyde Park, and Facetime with friends already in Sydney. Danny, the Khmer from Vietnam, says he joined the Khmer National Liberation Front (KNLF) in 2009 while studying at university in Thailand, and attended meetings that aired the “true story” of Cambodia, critical of Hun Sen’s government. In 2012 Danny came to Melbourne to study. The following year, his KNLF friends were among a group arrested by Thai police and deported to Cambodia, where they were jailed for plotting to overthrow the government. There are rumours, Danny says, that Hun Sen has paid Cambodians in Australia $600 to fly to Sydney to support him, and given them rooms in fancy hotels. “Not like us,” Danny says wryly, glancing around the cramped bus as he settles in for the journey. The bus crosses the Bolte Bridge and merges with the overnight thoroughfare of trucks on the Hume. There are also claims that some face risks to scholarships, or family and businesses back home, if they do not comply. 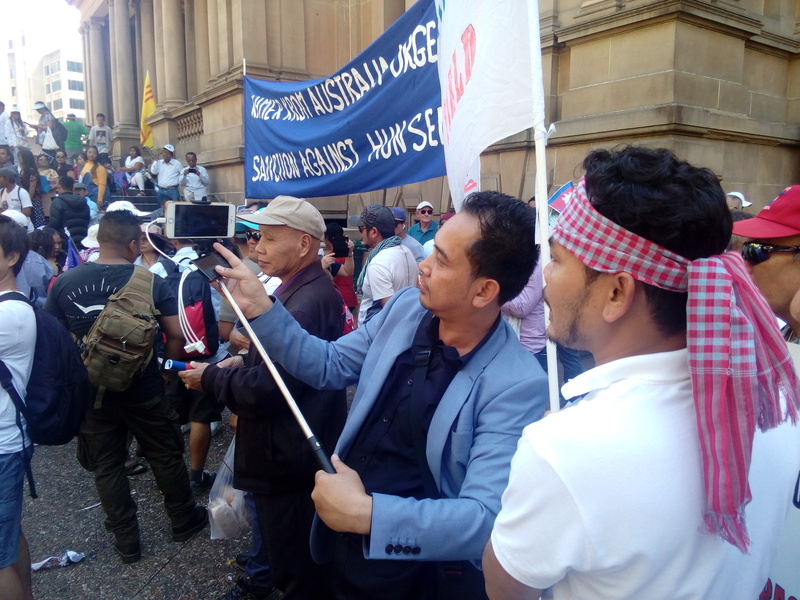 The next morning, March 17, the bleary-eyed protesters alight near Sydney’s Town Hall Square, joining with others from the Rohingya, Laos and Vietnamese communities, as well as Cambodians who have traveled from Canberra, Adelaide, Brisbane and Sydney. Not far away, the ASEAN and Australian leaders are meeting, within the CBD but behind police barricades. “The police are here to help, unlike the police at home,” organisers reassure the crowd from a podium decked out with flags from Australia, Laos, south Vietnam and Cambodia. Victorian MP and Cambodian community leader Hong Lim says that by not speaking out about Hun Sen’s threat to “beat” protesters, Malcolm Turnbull “failed his duty of care” towards them. “I hope the Prime Minister washes his hands many, many times,” Hong Lim says. He accuses the Prime Minister of shaking “the hand of blood, the hand of exploitation, the hand of criminality, the hand of brutality”. Among the crowd is Saly, from Sydney, protesting for the first time with her 90-year-old, wheelchair-bound mother, Sarip. (They ask that their surnames not be published.) In 1975, Saly and her family lived in Phnom Penh, where her father was a dentist, when they were ordered by the Khmer Rouge to leave the city for three days. They were never to return home. The Khmer Rouge held power in Cambodia for four years until 1979, and during this time an estimated two million people died from execution, starvation, disease and overwork. Protestor Saly with her mother, Sarip. On holiday in Cambodia last year, Saly’s cousin told her how his village had long lobbied for a road, and leading up to the communal elections last June pebbles were finally delivered for its construction. When the ruling party were not voted in, however, the pebbles were quickly taken away. This was an example of how corrupt the country is, he told her. Among Australia’s most high-profile Cambodian dissidents is Bou Rachana, wife of Cambodian political analyst Kem Ley, who was murdered in broad daylight in 2016 while buying coffee in Phnom Penh. Kem Ley was a prominent critic of the Cambodian government and his death is believed to have been politically motivated; the trial of the man convicted for his murder was brief and according to court monitors, rife with inconsistencies. Bou Rachana, then seven month’s pregnant, fled to Thailand with her four sons after her husband’s death. In February, she and her children were granted a special humanitarian refugee visa by Australia. Korath Ing, secretary of the opposition party’s Sydney branch, fled Cambodia with his family as a child. As they escaped to Thailand through the forest, Khmer Rouge soldiers sat by the path, watching them. To this day Korath wonders “why didn’t they kill us”. His mother was advised to constantly breastfeed her youngest child so he wouldn’t cry and give the family away while they walked the final 15 km from the Thai border to the UN refugee camp. Korath regularly shares posts on social media that are critical of the Cambodian government, but says his nieces and nephews living in Cambodia are afraid to like or share the posts. Convinced his name is on a “black list,” Korath says he cannot return to Cambodia— but that’s a price he’s willing to pay in agitating for the country’s freedom. “Now is the time to express our voice, the voice that our countrymen in Cambodia do not have,” Meng Heang Tak, Councillor for the City of Greater Dandenong, tells the crowd. “Hun Sen go home,” people chant. Drums beat. Flags wave. Cameras click, phones held high. Bou Rachana, wife of the murdered dissident, is also among the crowd. When the crowd dissipates, the podium is disassembled, and the square restored to its Saturday tranquility. The Melbourne protesters gather their placards and banners in the shade of the Town Hall. Some rest there, while others stroll the streets of Sydney. A few hours later the buses cross Anzac Bridge to the Cambodian temple in Bonnyrigg in Sydney’s west. In the carpark, the protesters burn Hun Sen’s effigy to more chanting and applause. After an evening meal of rice and meat, and a round of farewells, the buses set back down the Hume to Melbourne. Cambodian activists burn an effigy of Hun Sen outside a temple in Sydney’s west.